Umbilical cord blood banking or cord blood banking is the practice of preserving blood from the umbilical cord for future use. Such preserved cord blood is used in medical therapies in the similar approach as that of stem cells derived from bone marrow. Umbilical cord blood banking is practiced for using the cord blood stem cells for the purpose or re-populating blood and treating various medical conditions. Umbilical cord blood is observed to be a potential source of progenitor cells, which can be used for reconstitution of tissue, organs and other functional areas. The first successful umbilical cord blood transplantation was performed in 1988 and since then thousands of unrelated donor cord blood transplants have taken place worldwide. Cord blood transplantation is being recommended for a variety of diseases which include conditions such as sarcoma, leukemia, immune conditions, lymphoma, and even metabolic disorders. The first ever cord blood bank was established in 1991 and in the same decade several private and public cord blood banks began to be established worldwide. Transparency Market Research projects that the global umbilical cord blood banking market, which was pegged at US$3,124.4 mn in 2016, will expand at an 11.4% CAGR from 2017 to 2025, rising to a valuation of US$8,178.1 mn in 2025. Based on type of storage, private cord blood banks accounted for approximately 65.0% of the global market in 2016. Private cord blood banks offer cord blood storage for personal use of the donor’s family with charges for storage. The average cost for processing, testing, and storage of cord blood units in private banks is around US$1,500 and an additional US$150 per year for storage continuation. Despite such high costs, the segment of private cord blood banks is expected to remain the first choice of parents to store cord blood. Exhibiting a CAGR of 12.5% from 2017 to 2025, the segment is expected to witness a notable rise in its share in the global market by the end of the forecast period. Several factors, such as complete ownership rights preserved by the donor, flexible collection sites, and assured and secured access one’s cells give private cord blood banks significant leverage over public cord blood banks, resulting in the high preference to the former despite high costs. Geographically, the North America market for umbilical cord blood banking leads the global market, commanding more than 38.2% share in the global market in 2016. The North America market is expected to continue its strong growth in the next few years as well, chiefly owing to the rising demand for umbilical cord blood in stem cell research. Demand for cord blood banking in North America is high in the U.S., which held 83.8% market share in 2016, followed by Canada. Higher market share of the U.S. is attributed to the presence of highly established research and development infrastructure and rising investments by pharmaceutical giants in stem cell research. Asia Pacific is expected to dominate in terms of growth rate in the global umbilical cord blood banking market over the report’s forecast period. Although the region currently holds a nominal share in the global market, it exhibits enormous growth potential owing to vast improvement in health care reforms and increasing awareness of stem cell banking in select countries of Asia Pacific, such as India, Malaysia China, and Indonesia. Also, Asia Pacific is a relatively untapped regional market compared to developed regions, which is why it presents better opportunity for growth for companies. Some of the leading players operating in the global umbilical cord blood banking market are CBR Systems, Inc., ViaCord Inc., China Cord Blood Corporation, Cord Blood America, Inc., Cryo-Cell International, Inc., Cryo-Save AG, Cordlife Group Ltd., Vita 34 AG, LifeCell, and StemCyte Inc. This report on umbilical cord blood banking market studies the current as well as future prospects of the market globally. The stakeholders of this report include companies and intermediaries engaged in the manufacture, commercialization, providing storage services of umbilical cord blood storage such as public cord blood banks and private cord blood banks as well as new entrants planning to enter this market. This report comprises an elaborate executive summary along with a market snapshot providing overall information of various segments and sub-segments considered in the scope of the study. This section also provides the overall information and data analysis of the global umbilical cord blood banking market with respect to the leading market segments based on type of storage, major application segment, end-user, and geographies. Based on type of storage, the umbilical cord blood banking market has been majorly segmented into: public cord blood banks and private cord blood banks. In terms of application, the umbilical cord blood banking market divided into cancers, blood disorders, metabolic disorders, immune disorders, osteopetrosis, and others. In terms of end-users, the umbilical cord blood banking market has been broadly classified into hospitals (Medical Applications), pharmaceutical research (Drug Discovery), and research institutes (Scientific Research). Each of the market segments have been extensively analyzed based on the market related factors such as increasing adoption rate of umbilical cord blood banking and stem cell therapy, technological advancement, and growing number of use of stem cells therapy in various applications. Moreover, historical year-on-year growth have been taken into consideration while estimating the market size. The market size and forecast in terms of US$ million for each segment has been provided for the period from 2015 to 2025. The report also provides the compound annual growth rate (CAGR %) for each market segment for the forecast period from 2017 to 2025, considering 2016 as the base year. The market overview section of the report explores the market dynamics such as drivers, restraints, and opportunities that currently have a strong impact on the Umbilical Cord Blood Banking Market and could influence the market in the near future. Market attractiveness analysis has been provided in the market overview section in order to explain the intensity of competition in the market across different geographies. The competitive scenario among different market players is evaluated through market share analysis in the competitive landscape section of the report. All these factors would help market players to take strategic decisions in order to strengthen their positions and expand their shares in the global Umbilical Cord Blood Banking Market. 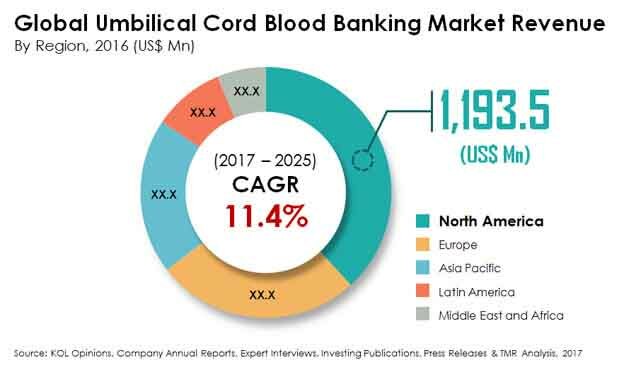 Geographically, umbilical cord blood banking market has been segmented into five major regions: North America, Europe, Asia Pacific, Latin America, and Middle East & Africa. The market size and forecast for each of these regions has been provided for the period from 2015 to 2025, along with their respective CAGRs for the forecast period from 2017 to 2025, considering 2016 as the base year. The report also provides with market size and forecast for major countries in the respective regions. A detailed qualitative analysis of factors responsible for driving and restraining the market growth and future opportunities has been provided in the market overview section. This section of the report also provides with market attractiveness analysis, porter’s five forces analysis, and market share analysis by key players, thus presenting a thorough analysis of the overall competitive scenario in the global umbilical cord blood banking market. The key findings section included in the report would assist existing market players in expanding their market shares, and new companies in establishing their presence in the global umbilical cord blood banking market. The report also profiles key players operating in the umbilical cord blood banking market which are CBR Systems, Inc., ViaCord Inc., China Cord Blood Corporation, Cord Blood America, Inc., Cryo-Cell International, Inc., Cryo-Save AG, Cordlife Group Ltd., Vita 34 AG, LifeCell, StemCyte Inc., and other prominent companies.